Q: According to reports, on June 18, US Secretary of State Mike Pompeo criticized China's economic and trade policies and pledged tough measures in response in his address to the Detroit Economic Club. What is your comment? A: The Spokesperson of the Commerce Ministry has made clear China's solemn position on the relevant trade issue. It must be pointed out that the US side is calling white black and making groundless accusations against China in order to get away with its unilateral and protectionist behaviors. Acting in a wayward way, the US side chose to abandon its previous consensus with China and reignite the trade war. Its actions betrayed the trust of everyone, hurt the interests of the people and business communities on the two sides, and worked against the benefits of the people around the world. Though a trade war is not something we want, we are definitely not afraid of one. We will continue to take effective measures to firmly safeguard the interests of our nation and our people and resolutely uphold the economic globalization and the multilateral trading system. No matter what happens outside China, we will continue to move forward our reform and opening-up endeavors, pursue high-quality economic growth, and accelerate the building of a modern economic system, following our set pace and always placing the people at the center of all our efforts. Our advice for the US is that it should come back to its senses and stop saying or doing anything that benefits none. That would be the only way out of the current issue. Q: Chairman Kim Jong Un arrived in Beijing this morning. This is his third visit to China. What is your expectation for his visit? What is your comment? A: Chairman of the Workers' Party of Korea and Chairman of the State Affairs Commission of the DPRK Kim Jong Un is visiting China from June 19 to 20. We hope that his visit will help deepen China-DPRK relations, strengthen bilateral strategic communication on major issues, and promote regional peace and stability. Q: Last Friday, Russian Foreign Ministry Spokeswoman Maria Zakharova said that Russia is for the cancellation of all unilateral sanctions against the DPRK and the modification of the UN Security Council's sanctions against the DPRK. What is your comment? A: China consistently opposes the so-called unilateral sanctions imposed outside the framework of the UN Security Council. This position is quite clear-cut. Meanwhile, China believes that the sanctions of the Security Council themselves are not the end. All parties should support and coordinate with the diplomatic efforts to realize denuclearization on the Korean Peninsula through talks and move forward the political settlement of the Korean Peninsula issue. Q: Does the Foreign Ministry believe that a trade war between China and the US has officially begun? A: As we said before, China does not want a trade war and certainly is not afraid of fighting one. If a trade war is waged against us, we will definitely safeguard our legitimate and lawful rights and interests. Q: Why is Kim Jong Un's visit not a state visit? Why are there reports before he wraps up his visit? What practice is China following in releasing the relevant information? A: The press release says that Chairman Kim Jong Un is visiting China. It surely makes sense to release the information in this way. As to the timing for the press release, it is decided on a case-by-case basis. Q: Afghan President Ghani announced on June 16 that the Afghan government will extend its ceasefire with the Taliban and is prepared to have full talks with the Taliban on the ceasefire issue. Meanwhile, the Taliban said they have no intention to extend the ceasefire. What is your comment? A: We have noted relevant reports. 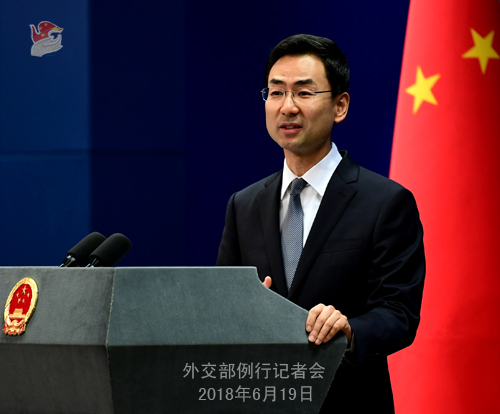 China commends these efforts made by the Afghan government in promoting peace and welcomes its decision to extend ceasefire. 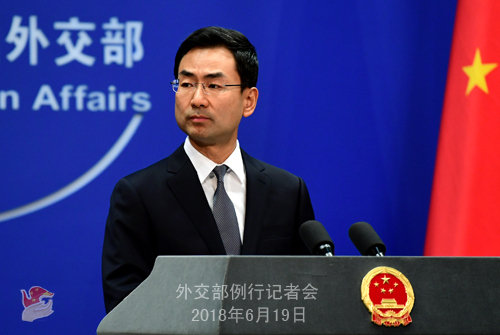 China calls on the conflicting parties in Afghanistan to realize national reconciliation and peace through dialogue and political talks. China firmly supports the "Afghan-led and Afghan-owned" peace and reconciliation process. We stand ready to work with the international community in consistently playing a constructive role for an early realization of peace in Afghanistan. Q: President Trump said yesterday that he will move to create "a space force" as the sixth military branch. Considering that his advisers criticized China and Russia for militarizing the space on his campaign trail, what is China's comment on this US decision? Are you afraid that it may trigger an arms race in the space? Does China support signing international conventions on banning the militarization of the outer space? A: We have noted relevant reports. Outer space is all humanity's property. 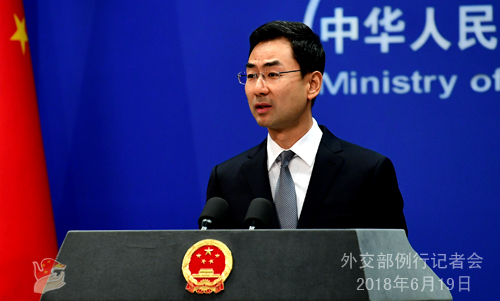 China always advocates the peaceful use of outer space and opposes the placement of weapons and an arms race in outer space. In particular, we oppose turning outer space into a battlefield. We hope that all parties could work together to ensure that outer space will forever be peaceful and tranquil. Q: When Chairman Kim Jong Un visited Dalian last time, China said that it was the DPRK side who raised the request to visit. How about this time? A: I know you would like to have more information on Chairman Kim Jong Un's visit. So please keep following the news. The Chinese side will release relevant information in a timely manner. Everything will be clear by then. Q: Recently, the French Senate Committee on Foreign Affairs, Defense and Armed Forces issued an assessment report on the Belt and Road Initiative, which suggested that France should take a more active part in this Initiative and play an important guiding role at the EU-China level. What is your comment? A: China has noted the relevant report released by the French Senate. We appreciate and welcome the willingness demonstrated by the French side to participate in the Belt and Road Initiative. The Belt and Road Initiative is an open and inclusive initiative for international cooperation. As it follows the principle of extensive consultation, joint contribution and shared benefits, all participating countries can play their roles and gain benefits from it. When it comes to specific cooperation, we accommodate the comfort level of all parties, remain open and transparent and abide by the universally acknowledged international norms and rules. We are willing to explore the specific ways to conduct cooperation with France and other European countries under the framework of the Belt and Road Initiative, effectively synergize development strategies, expand converging interests and better achieve mutual benefit and win-win outcomes. Q: Firstly, is Chairman Kim Jong Un's visit directly related to the DPRK-US summit in Singapore? Will he meet with President Xi Jinping and inform President Xi of the DPRK-US summit? What is the purpose of his visit? Secondly, two Japanese airlines changed "Taiwan" to "Taiwan, China'' on their official websites. In response, the Taiwanese authorities lodged stern protests to the two companies through the "Taipei Representative Office in Japan". They claimed that the mainland suppressed Taiwan in the international space, which aroused repulsion from the people in Taiwan. What is your response? A: Please keep closely following Chairman Kim Jong Un's visit to China. 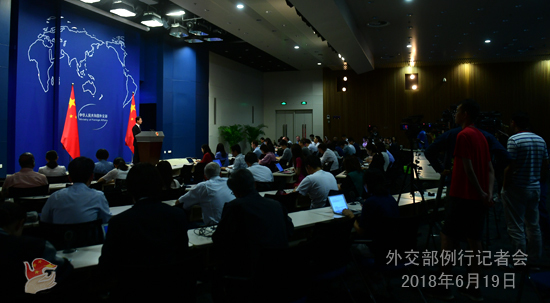 The Chinese side will release relevant information in a timely manner and we will get a clearer picture by then. With regard to your second question, we have made clear our position many times. There is only one China in the world and Hong Kong, Macau and Taiwan have always been parts of China. This is an objective fact, a common sense as well as the general consensus of the international community. The foreign enterprises operating in China should respect China's sovereignty and territorial integrity, abide by China's laws and respect the national feelings of the Chinese people. This is the basic requirement for any foreign company doing business in China. I urge the Taiwanese authorities to refrain from attempting to kick against the pricks and hold back the trend of history. Q: On June 18, a 6.1-magnitude earthquake that shook the western Japan prefecture has killed four people. Has China sent messages of condolences to the Japanese side? A: We have noted that an earthquake has struck western Japan. We send our condolences to the victims and sympathy to the bereaved families and the injured. Q: The US has announced that it is considering imposing tariffs on an additional $200 billion worth of Chinese goods. It's seen by many analysts as being unprecedented in scale and scope. It means that the vast majority of two-way trade between China and America would be hit by punitive import taxes. I just wonder if you could give us the Chinese Foreign Ministry's view on the significance of taking that large-scale step and how seriously you would view that action if the US does go ahead with it? A: In brief, our advice for the US is that it should come back to its senses and stop saying or doing anything that benefits none. Q: The US and the ROK have decided to suspend their joint military exercises which were scheduled in August this year. What is your comment? A: We have responded to this question before. Today I can give you a formal reply once again. Suspending joint military drills on the part of the US and the ROK is a positive and constructive step. China welcomes it. We hope that all relevant parties can continue to meet each other halfway and make further efforts to realize the denuclearization of the Korean Peninsula and advance the political settlement process of the Korean Peninsula issue. Q: Can you tell us will Chairman Kim Jong Un meet with President Xi Jinping and also following the summit in Singapore, what additional steps in the short term does China want to see the DPRK and the US proceed with? A: Please keep following the news. The Chinese side will release relevant information in a timely manner.